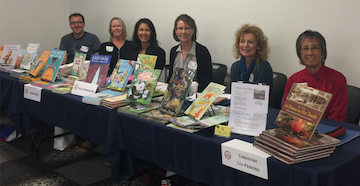 The Rocky Mountain Chapter of SCBWI hosted a one-day mini-conference with sessions on picture books, novels, nonfiction, and professional skills. In my session, “Asking Questions: The Heart of Nonfiction,” I discussed ways to make nonfiction compelling by sharing how questions drive each stage of my writing process from initial curiosity to research, notetaking, outlining, focusing the writing, and making connections to readers. Thank you, RMC-SCBWI for a fun and inspiring day! One of my critique groups (Todd Tuell, Marjorie Blain Parker, Denise Vega, Julie Danneberg, Kathleen Pelley, and me) presented a Q&A panel at this annual event of the Pikes Peak Library District. We shared our experiences and tips on writing for children, which you can view in this video. Thank you, PPLD, for a wonderful day! I’ve been in a critique group for over twenty(!) years. We did our first Author Panel together, offering our best writing advice and answering questions. Thank you to Barnes & Noble Denver for hosting us! 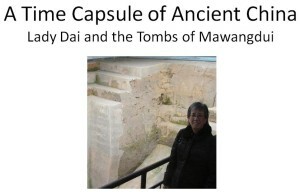 I presented a webinar, “A Time Capsule of Ancient China: Lady Dai and the Tombs of Mawangdui,” hosted by the Five College Center for East Asian Studies (FCCEAS), a national site of the National Consortium for Teaching about Asia (NCTAsia). I introduced highlights of the discoveries from Mawangdui, pointed to resources on my website for teaching or studying more about it, and answered questions. The webinar is archived for viewing at https://attendee.gotowebinar.com/recording/7876052851393793795. I shared strategies for writing nonfiction at a Young Writers’ Workshop sponsored by the Education Nonprofit Corporation (ENC). The students (along with a few adults) impressed me with their creativity. Thank you, ENC! 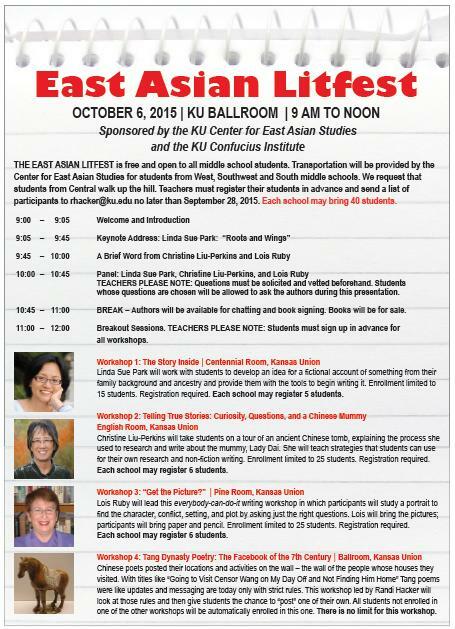 The Center for East Asian Studies (CEAS) and the Confucius Institute at the University of Kansas held their first literary festival for middle school students. I led a breakout session and also participated on a Q&A panel with fellow authors Linda Sue Park and Lois Ruby. The students made it really fun with their interest and terrific questions! Christine Liu-Perkins will take students on a tour of an ancient Chinese tomb, explaining the process she used to research and write about the mummy, Lady Dai. She will teach strategies that students can use for their own research and non-fiction writing. The University Daily Kansan reported on the event, and CEAS posted a photo album of people (and books) there. Many thanks to the KU CEAS and KU Confucius Institute! The audience of 6th graders were enthusiastic and attentive while learning about Lady Dai of Mawangdui and writing research projects. They are pros at solving riddles! With thanks to Mrs. Poettker and South Middle School! It was fun sharing highlights of the Mawangdui tombs and of writing the book, admiring the Chinese knotted necklaces that people made, and eating a rice cake dessert. Special thanks to Miho Shida! Thanks to the Hunan Provincial Museum, I had an amazing time with experts and scholars from around the world discussing research on the Mawangdui tombs. This opportunity also fulfilled my dream of returning to the tombsites of Lady Dai, the Marquis of Dai, and their son. The Chinese version of my article “Exploring Mawangdui as a Time Capsule with Students and General Audiences” is published in the Proceedings from the symposium. In celebration of Children’s Book Week, MG/YA authors Melanie Crowder, Lindsay Eland, Ellen Mahoney, Claudia Mills, Barbara Wright, and I held a Q&A panel discussion and signed our new books. Thank you, Tattered Cover! I enjoyed sharing my presentation, “Research is Fun! 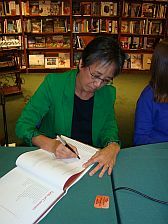 An Author’s Process in Writing Nonfiction,” with educators, librarians, and other literacy advocates of the Colorado Council International Reading Association. Thank you, CCIRA!